Maintaining the look and feel of our garden is very important as this is what brings freshness to our homes. Fortunately, there are a lot of ways you can do that. But the best one is to use a garden impact sprinkler. But then again, you need to consider a lot of things to find the best one. And that’s what we’re going to talk about in this article. Here, we’ll be teaching you the things you need to know to get the best one. We’ll also be suggesting to you the best impact sprinklers you can buy. The Orbit Zinc Impact Sprinkler is one you should try if you have a large lawn or if you want to cover a huge area. But even though this is great for large lawns, this will still be effective in small areas because of the adjustability feature it has. Its spray pattern can be adjusted from partial circle to a full circle or vice versa. 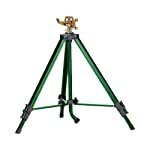 You can also adjust its tripod base from 16 inches to 37.5 inches. That’s how versatile and flexible this impact sprinkler is. It’s because of this that it had been one of our most favorite impact sprinklers. It even has its own 1/2 inch male impact head that’s threaded. It’s got a pretty good coverage as it can cover a huge area. You won’t be short of coverage when you got this one. And even though it has huge area coverage, it’s still very flexible as you can adjust it if you’re going to use it on a smaller area. Its quality is also pretty nice. You can see that it’s very sturdy and premium made. It’s a bit inconsistent especially if you’re going to always adjust its settings. It’s best if the settings are left unchanged. Its tripod material also feels a bit cheap because of its texture. Its surface is also not that smooth. 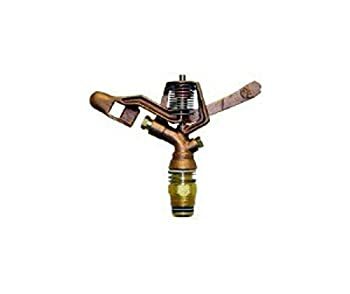 The QVS Full Circle Brass Impact Sprinkler is another one you might want to try. It has a 3/4 inch adjustable part that enables you to turn its sprinkling pattern to a full circle. If you want to try different sprinkling patterns every now and then, this one’s for you. This one’s also got a 5/32 inch single nozzle that’s made of brass. This gives it a very solid quality which adds more service life to it. This one’s also got a 25-degree nozzle with a plug attached, giving you lots of control over the sprinkler. It has one of the best coverage out there. You won’t be short of water when you’re using this one. The price is also pretty good as it’s affordable compared to other brands. Its design is off. So if you want to install one in your lawn, make sure that it can’t be seen easily. The Orbit 55025 Satellite 2 Impact Sprinkler is another one that we'd recommend. This one is highly recommended because of its adjustable distance. 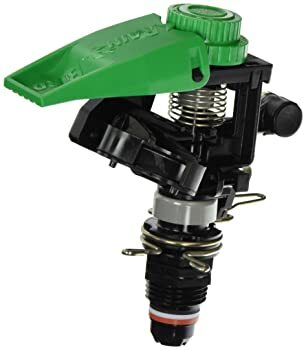 But it's not just that as this one's also got a diffuser pin that gives you total control over how you want your impact sprinkler to water your garden. This also has an easy to adjust pattern that lets you choose if you want it to sprinkle water in a full circle or in a part circle. 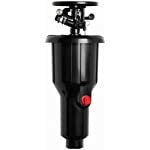 What we also like about this one is its heavy duty canister that has a ¼-inch and 3/4-inch dual inlets. This makes the installation process easier than other sprinklers that don't have this feature. And if you have a dirty water supply, don't worry, because this is made to handle situations like these. It is very easy to install thanks to its advanced but simple features. Adjusting this one is also easy to do. It won’t even take you five seconds to do it. There are times when the mechanism sticks. To avoid this from happening, you better wash it frequently. The spread is also not that remarkable. 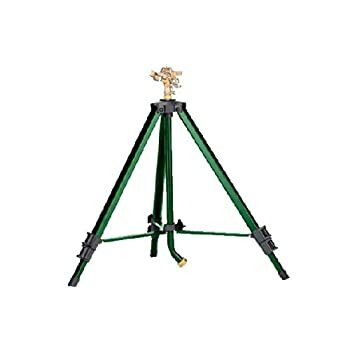 The Orbit Heavy Duty Brass Lawn Impact Sprinkler has coverage of 7,800 square feet. This is equivalent to a 100-feet diameter coverage, which is more than enough if you've got a medium-sized to large-sized lawn. 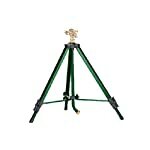 The tripod can also be easily adjusted thanks to its smooth mechanism. If you want to adjust its sprinkling pattern to a partial circle, then simply flick the switch. Or if you want to bring it back to sprinkling full circle, do the same process again. If you're the kind of person who's always on-the-go, and you wish to bring this sprinkler with you, then you won't have any problem with it. 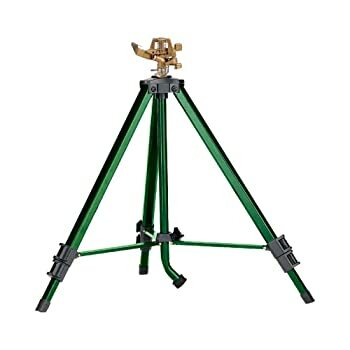 It's because its tripod is retractable. The gooseneck type connection also provides an easy hose connection. Despite its affordability, it still has a lot of great features that are very useful. This one’s a user-friendly sprinkler. It doesn’t look good because of its bulky design. This one is only highly effective on small lawns. The Rain Bird P5-R PLUS Plastic Impact Sprinkler is another one worth reckoning. This has a double-weighted arm that’s made of brass, giving it a solid look and performance. It also has a diffuser screw that makes small droplets of water for a uniform coverage. But the main highlight of this sprinkler is its removable nozzle that features a bayonet design, allowing you easy access to its interior when cleaning it. The materials this one is made of can clearly be seen as of high quality. Its adjustability feature makes this as one of the best performing sprinklers out there. It also is visually pleasing thanks to its sleek design. The features are a bit tricky to use. What Is An Impact Sprinkler? There are many types of garden sprinklers, and one of those is the impact sprinkler. These impact sprinklers are driven by a circular motion made possible by the force of the water. It then pivots around its top using the threaded attachment nut found in its structure. Though there are some places which replace these with gear-driven rotor head sprinklers, the use of impact sprinklers is still pretty much alive in other parts of the world. The best thing about having an impact sprinkler is its huge coverage. Compared to other garden sprinklers, impact sprinklers can cover a bigger area because of the mechanism and way that the water sprinkles out of it. It’s because of this that impact sprinklers are the sprinkler of choice of homeowners who have big gardens or lawns. There are even some cases when these impact sprinklers are equivalent to two pieces of standard garden sprinklers. What’s great about these impact sprinklers is its water efficiency. They are best known for their water-efficient design because it uses minimal water. But even though it doesn’t use much water, it can still cover a huge area. That’s what separates them from the other sprinkler types. When you have one of these, you’ll surely experience a reduction in your water bill because it uses just enough water it needs to sprinkler on your garden or lawn. These are made for the sake of convenience because of its automated design. This means that you don’t need to be physically present to turn the impact sprinkler on or off. Though this has been the case for previous models, there are now premium sprinklers that have automated switch feature that has a built-in timer. All you have to do is set the time when they’ll sprinkle water or when they’ll switch off. What happens when you use an impact sprinkler is that your garden or lawn benefits greatly from it. Why? It’s because it supplies them with enough water, not too much or not too few. It supplies them with the right amount of water which in turn makes them healthier. And when this happens, you’ll notice your garden looking fresher and more alive than ever. It would turn lush green, which would then add beauty to your home. This is very important especially that your garden is what adds freshness and is what relaxes your senses. Just like what was mentioned earlier, having an impact sprinkler would save you the hassle of having to manually turn it on or off. This is because of its automation. And with its automation comes the right supply of water needed to keep them healthy and looking freshly green. It does this without the risk of flooding because it supplies the right amount of water to the area you intend to water. There are a lot of things you need to consider when choosing an impact sprinkler. But the first one should always be the coverage. It’s because this is what impact sprinklers are meant for, which is to sprinkler water to your intended area of coverage. So make sure that it will reach the place you intend to water. You also need to know if you’re going to use it on a small lawn, medium-sized one, or a huge lawn. Make sure that it’s durable so that you’ll get the most out of your money. It should have a long service life so that you don’t need to buy a new one just after a few months or years of use. Ensuring the durability of an impact sprinkler also gives you the assurance that it won’t easily be damaged because it’s of high quality. You can do this by touching the surface and feeling any bumps on its texture. The surface of the impact sprinkler should be as smooth as possible as these are a few signs that it undergone a precision crafted process. Making sure that it looks good might be nonsense for some, as there are a lot of people who tend to disregard the visual appearance of a product. Well, in the case of an impact sprinkler, you need to make sure that it looks good. It’s because this is going to be placed on the garden. And when it’s placed there, there are a lot of people who are going to see it. Hence, you need to make sure that it looks good. Because if not, then it would be an eye sore not only to them, but to your home as well. You see, the visual look of a product is a reflection of your own home. If it doesn’t look good, then chances are that you might not be keen to details. Take note too that being keen to details is as important as maintaining the feel of your home. Then there’s the element of price that you should never disregard. This is very important because this is where you’ll see if the product is worth buying or not. When choosing an impact sprinkler, be sure that it’s not over-priced. Though you might think that an expensive product is of high quality, then you’ve got it wrong. Yes, this might apply to some, but not to all. But you should also make sure that it’s not too cheap. Those impact sprinklers that are very affordable is most of the time made of low quality materials, so you need to avoid these kinds of products. To keep it safe, choose those that are in the mid-range price so that you’re assured that it’s not overly priced or cheap. The best impact sprinkler on the list is the Rain Bird P5-R PLUS Plastic Impact Sprinkler. Not only is this visually pleasing, but it’s also user-friendly and performs pretty well too. That’s how cool this product is. 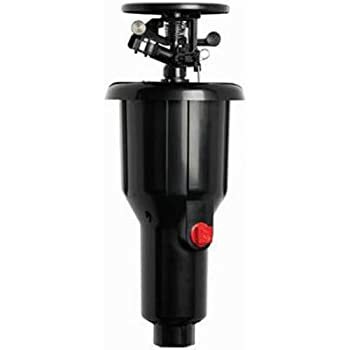 So if you want to have the best impact sprinkler, then this one’s your best choice. You’ll surely see the wonder of it when you use it.